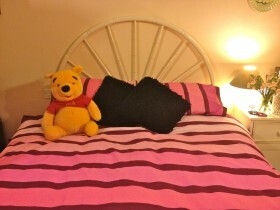 This the first time I have reviewed bedding, it is quite an important item in our everyday lives and something I am very fussy about. I hate rough cotton bedding, I hate nylon sheets and I hate bedding that needs loads of ironing. I want to take it out the dryer shake it and put it on the bed. I do iron pillow slips if I have people coming to stay! This duvet set arrived very quickly and nicely packed and looking more expensive than it was, the set is a 50/50 polyester cotton mix, it was from the sale range at www.yorkshirelinen.com now selling at £17.99, true to the website description in every word, I did find that on unpacking it I felt I needed to wash it first as it had a lot of starch dressing on it and they do recommend washing first. This company do seem to have a good selection, I often find it difficult to buy super king-size duvet covers but they have a fantastic selection, all at the most competitive prices. Once washed the fabric was a lot softer and very easy to iron, the seams are typical commercial stitching which is what I would expect. The fasteners are plastic poppers which snap together nicely. The teenage girls in the family love the vibrant colour of this set and it will be very easy to accessorize as the bold stripes lends itself to contemporary bedrooms. The girls spent a night sleeping in that bed and then I slept in it to try it out, and yes, very cosy and comfortable cotton mix. I spilt coffee on it just to see how the material coped with stains. Excellent, washed straight out no trace and that’s the second wash it has had, colour still as bright and it tumble dries very well. Excellent product at excellent price with very good customer service.